Once in a great while, an artist comes along whose work is so distinctive, so unusual, so imaginative, and so colorful that it stands out from the crowd, much like a peacock stands out in a colony of penguins. Elizabeth St. Hilaire is such an artist. I have seen thousands of works of art over the years - in galleries, museums, art shows, hotels, and in private collectors' homes - but I've never seen art like Elizabeth's. Who creates fabulous flamingos, pretty pigs, darling donkeys, colorful Koi, delightful Dalmatians, and charming chickens - all out of bits of torn painted paper? No one. Elizabeth is one-of-a-kind. Her work, both in style and method, is uniquely hers. It was her signature bird - the peacock - that first caught my eye. A friend had emailed an image of Peter Peacock, a large collage painting on display in a gallery in Sedona. 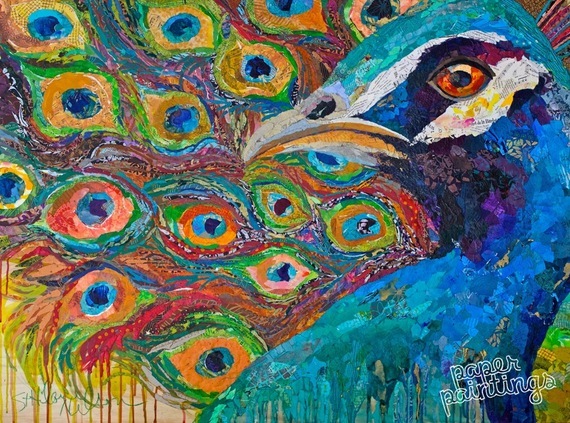 I've seen many peacocks over the years, but never seen a one quite like the one that Beth created with paint and collage. 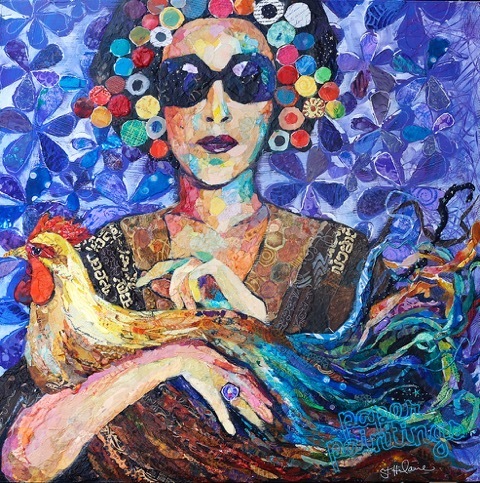 I had to learn more about the fabulous artist who could create such a powerful peacock image, so I tracked down her web site, made contact and asked to interview her. 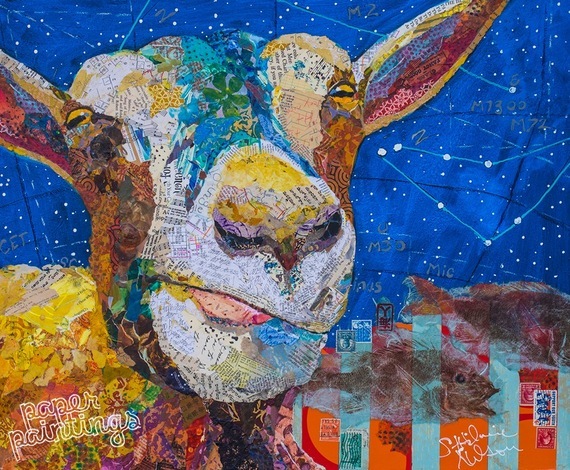 BJG: I've enjoyed looking at, and often buying, art over the years but I'd never seen torn paper paintings until I discovered your wonderful work. Is this an artistic medium that you invented? Are there others who do what you do? Tell me how you came to "paint" with torn paper. Elizabeth St. Hilaire: I have a Bachelor's in Fine Art from Syracuse University; I graduated with honors in 1990. When I was a student, realism was considered the mark of a good artist. So I spent hours and hours drawing what I saw - looking closely, rendering accurately. My professors demanded traditional media, recognizable subject matter, and tried-and-true techniques. Drawing is the foundation of art as ballet is the foundation of dance, so a classically trained artist must start with lots of drawing. This I understood. But over time I began to realize that I was creating work that I personally did not love - or even like. I wanted to be loose; I wanted to paint like the impressionists; I wanted my work to have energy, spontaneity, and excitement. I wasn't achieving what I wanted. So I began searching for solutions, for pathways to creating better work. I started incorporating papers into my acrylic paintings, painting over paper, painting under paper, painting with paper. A combination of paper and paint began to loosen things up. 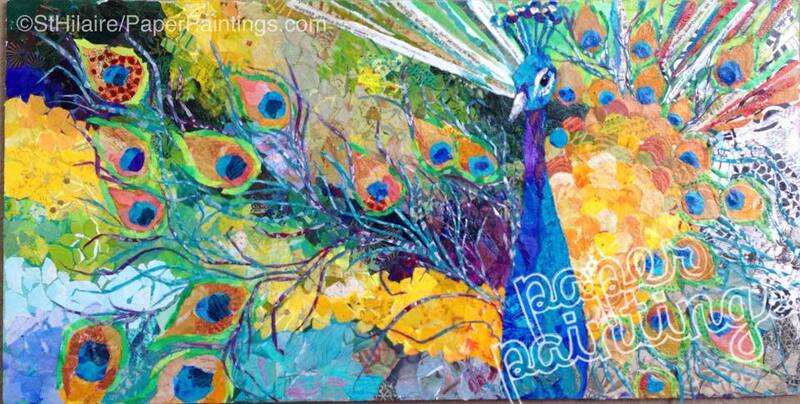 Painting over crumpled, glued down tissue paper could not be too detailed or labored. Around the time I was experimenting with my process, my father paid a visit -- bringing with him a box of things from my childhood, things I had left in the attic the day I left my childhood home. "It's time" he said "for me to give this box of things to you. I didn't have the heart to look through it or throw anything out. That's up to you." I briefly dug through the box: report cards, old math tests, ticket stubs, first hair cut snippet, cards from my parents' wedding and their first baby (me). It occurred to me that incorporating these papers into a piece of art would allow them to live on in a new life, preserved and made into something I could appreciate every day on the wall. So I decided to create a portrait of my mother, since so many of the papers had to do with her, my father, and me. That piece, "Looking in on Jane," won Best of Show at the Orlando Visual Artists League that year. I had never even placed in the top three before, let alone won Best of Show. It was this collaged portrait of my mother that drove me deeper into the possibilities of mixed media in an impressionistic, painterly style. In the last ten years, my style has evolved and changed as I've experimented and grown. I didn't learn the technique from anyone else's instruction - just my own successes and failures. My style was certainly built upon the foundation I acquired while studying fine art in college - those hours of accurately studying form, light, and shadow were by no means wasted. I have taught my technique to many others, and I have my work on-line, so yes, there are other people whose work does look much like mine. Many of them are former students, or people who have purchased my instructional DVD. Some are just artists who have looked closely and dissected my style. Either way, it's nice to see mixed media collage taking such a foothold and being recognized as a reputable medium in galleries and juried shows. Who do you most love about being an artist? Is there anything you don't love about being an artist? Elizabeth: What I love most about being an artist is creating a legacy. I love knowing that I will teach and inspire others to be artists and that they will someday win "Best of Show" or decide to declare art as their college major. I also love knowing that the artwork that I create will hang on people's walls and be part of what makes their house a home. These things I love; these things are important to me; these things make me feel like my job is makes a difference in the world. If I think about things I don't love about being an artist, it would be administrative stuff: keeping track of books, invoicing, taxes, billing, insurance, inventory, profit and loss, ..... yuck. But until I can afford an assistant, I do it all myself. It's part of being a successful artist. You're very prolific - producing wonderful works of art in seemingly no time at all. 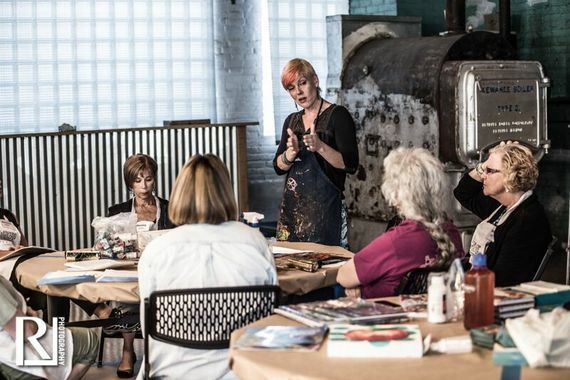 You're also very versatile - you teach workshops around the world; you offer on-line workshops; you sell original works of art; and you license your art for merchandising to Pier One and other stores. Where do you get your boundless energy? How do you manage your priorities and your time? Elizabeth: I tell people that I work quickly because I need to maintain the looseness and spontaneity of my art. If I labor over my work, overwork it, you can tell. I never want to lose the painterly, impressionistic look I have achieved, so I work quickly, move fast, stay loose. Also, I love what I do. I enjoy painting and the finished product. I paint as many hours as I can each day. Versatility is a necessity. I am a full-time working artist. What does this mean exactly? This means that my income is 100% from fine art. I do not have a husband supporting me; I do not have a part time job as a barista at Starbucks. Teaching on-line and around the world, licensing my art to be reproduced as prints and on household items, publishing books, and selling originals all add up to a decent living. Not having all your eggs in one basket is timeless advice. When I have a slow teaching month, I produce more paintings in my studio. When I need to pay my quarterly taxes, I am happy for my quarterly licensing check. My self-published books and digital downloads make money for me long after the hours and weeks and months that I spent writing, photographing, and publishing them. So many artists seem to be terrible business people. They love to create their art but they hate marketing and selling. As a result, many artists can't make a living making art. But you do. What advice would you give to other artists? What can they learn from your experience as a successful artist who makes a very nice living making art? 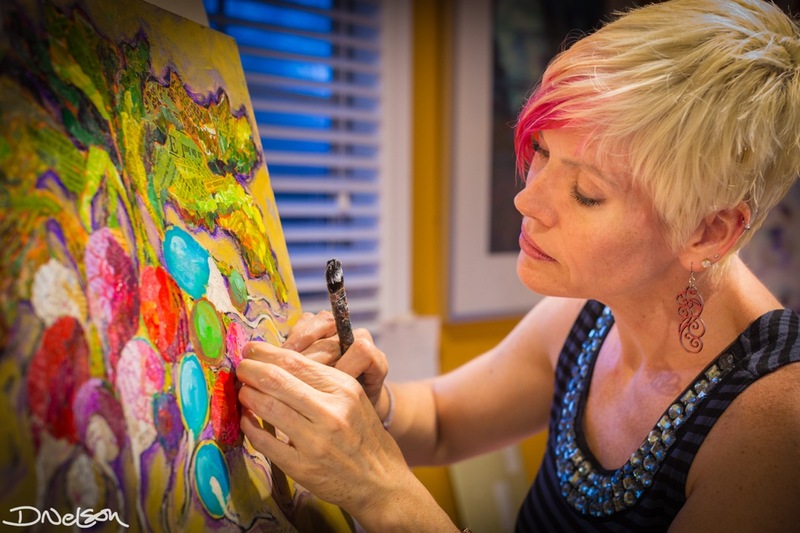 Elizabeth: When I first started out, I read the most amazing book called "I'd Rather Be in the Studio: The Artist's No Excuse Guide to Self Promotion" by Alyson B. Stanfield. Alyson summed it up beautifully when she basically noted that artists just want to create the work, to stay in the studio, and hope that it sells itself. We don't want to have to put in the hours and hours of time it takes to market and sell our work (minimum 60% of my time). BUT.... if you don't do it, you end up as your own biggest collector. Before I became a full-time fine artist, I was a self-employed graphic artist for twenty years. I marketed and sold a variety of products for a diverse group of clients. Nothing prepared me better for selling myself than the time I spent selling for others. I have created my own logo, website, business cards, brochures, post cards, banners workshop flyers, e-mail blasts, newsletters, Facebook banners, window signage, etc. AND I have a thick skin - I know how not to take rejection of my art personally. My advice to other artists? Learn how to make the most of social media - that is the direction things are going and it reaches the largest audience for the smallest investment. Facebook is my weapon of choice, closely followed by Pinterest. Both of these platforms can be updated and edited from your phone (the ultimate in immediacy). We can engage people and hold their attention with constant, steady updates and insights into the art making process - like, what's on my easel right now. What is your overall vision for your life as an artist? What is the future you see for yourself? Elizabeth: My vision for my life and myself as an artist? Well, I am pretty much already there. All I ever wanted was to be able to support myself as a fine artist, to be able to travel, visit new places and meet new people. I also wanted to inspire others, which teaching adults and volunteering with children has allowed me to achieve as well. As for the future? I'd like to slow down (just a little) on the travel, to paint large scale works (once in a while) that are totally from my own imagination, regardless of whether or not I think they will sell. And sometimes, when I get a really good night's sleep, I dream about building a small scale bed and breakfast that would offer a diversity of art workshops in an amazingly creative environment. I envision myself teaching, hosting other teachers, and of course, baking homemade pies and citrus breakfast cake. Any questions I should have asked you, but didn't? Elizabeth: My favorite artist is Gustav Klimt. I love his combination of flat decorative patterning and realistic rendering. I was able to make my pilgrimage to Vienna, Austria to see his work in person, at the Austrian Gallery in 1990. My visit was before the Austrian government had to return five of the eleven paintings in their collection to Maria Altman -- the case that is the subject of the movie "Woman in Gold." I was lucky enough to sit in front of both portraits of Adele Bloch-Bauer for hours on end, making sketches and notes through the shift change of the museum guards. I will never forget it - traveling alone, staying in a youth hostel, eating only a loaf of bread and a wheel of cheese I carried around with me. Making the trip solely for the purpose of experiencing his work, breathing it in, soaking it up, being enveloped by it, overwhelmed with it. I am, and always will be, an artist, en toto.